Aquamarine is a gem in the Beryl group of minerals blue to light greenish-blue colors. 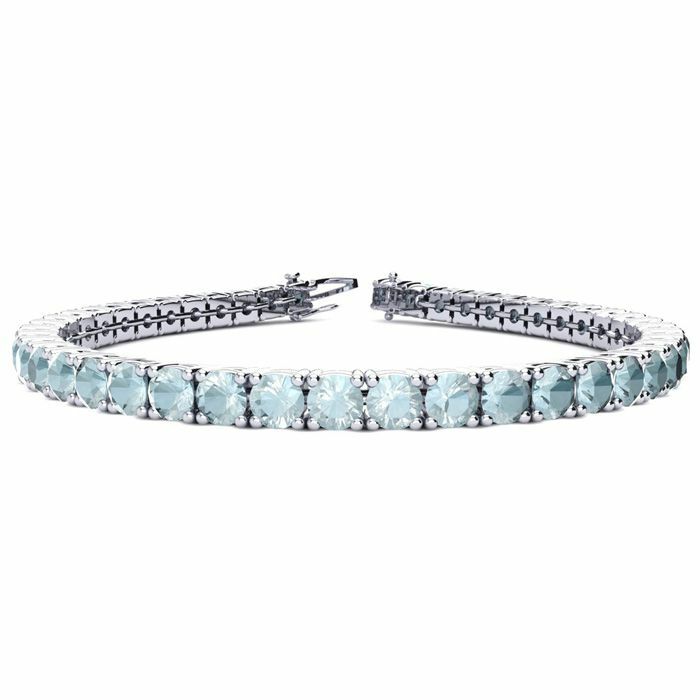 This classic gemstone bracelet features shimmering aquamarine gemstones. The 6 inch bracelet contains 39 gemstones at 6.24 carats. The 6.5 inch bracelet contains 43 gemstones at 6.88 carats. The 7 inch bracelet contains 46 gemstones at 7.36 carats. The 7.5 inch bracelet contains 49 gemstones at 7.84 carats. The 8 inch bracelet contains 53 gemstones at 8.48 carats. The 8.5 inch bracelet contains 56 gemstones at 8.96 carats. The 9 inch bracelet contains 59 gemstones at 9.44 carats. This bracelet is approximately 3.8mm wide and is crafted in 14 karat white gold. This bracelet has a secure, box with tongue and safety clasp.